the Orange team has a great theme for you.. I don't often do GET WELL cards and I really need to. I know people get sick and somewhere a get well card would really help them feel better. I need to do then more often.. maybe an ATG challenge would be a good time.. Any how I have this old rubber /wood Diamond stamp so I stamped it on some light gray paper and colored with my pencils. I added some Nuvo drops. I used My Favorite Things stitch dies. I stamped the Lawn Fawn sentiment and bug. I went around the edges with Quick Quote ink on the sentiment. I think this would really make someone feel better.. maybe a guy.. LOL my husband had a comment I will not repeat.. lol..
Oh wow! Love this card! Great image! I bet your husbands comment included bend over and cough. LOL. Too funny! I think he would frighten you into saying you felt better, fabulous fun image and card thank you for joining in at MMM. Love this image and all the detail. 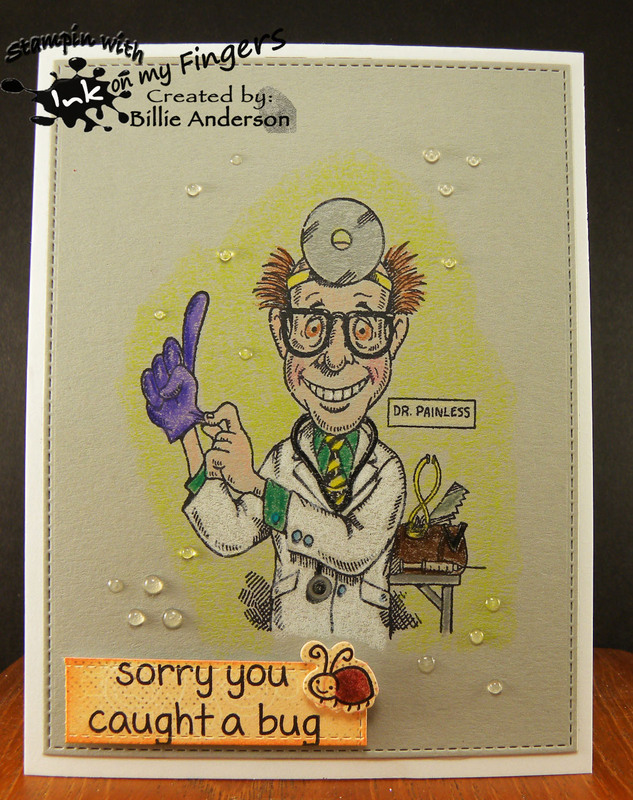 This card would help me to smile if I was poorly. A fabulous image, I love it, the old ones are still good ones. Thanks for taking part in our challenge at Make My Monday. Caz. DT. Too funny! Love it. Great seeing this on the PIP challenge this week. What an adorable stamp. Great coloring and I just love that bug sentiment. Thank you so much for joining us at Simon Says Stamp Wednesday's Anything Goes Challenge. Good Luck!